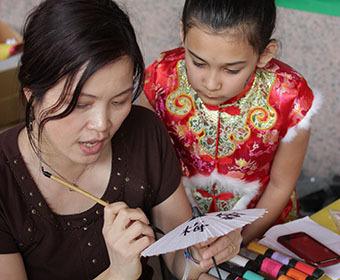 (Feb. 4, 2019) -- The UTSA Institute of Texan Cultures (ITC) will celebrate the Chinese New Year and the many Asian cultures that have become a part of the state’s identity during the 32nd annual Asian Festival, Saturday, Feb. 9 from 10 a.m. to 5 p.m. at the ITC on the UTSA Hemisfair Campus. The 2019 festival, a UTSA 50th anniversary signature event, opens with the thunder of firecrackers and drums, as Lion Dancers frighten away evil spirits, and bring good fortune for the year ahead. While the festival began as a Chinese New Year celebration, over time, other Asian communities joined the festivities, making the event a true showcase of the Asian continent, from China, to Korea, Japan, the South China Sea, the Indian sub-continent, and the island nations of the Pacific. >> Purchase tickets to the 2019 Asian Festival. Entertainment includes two stages for music and dance, a martial arts demonstration area, a gallery featuring bonsai and ikebana flower arrangements, a room of animé showings and activities, a mah-jong table, dozens of vendors with Asian crafts and décor, and a variety of authentic Asian foods. >> View the 2019 Asian Festival Visitors Guide. Also joining the festival this year, the Japanese community has called on the Sumo steakhouse to prepare Akaushi steak and other favorites; Newa Paper Boutique will join the vendors on the veranda selling their Indonesian crafts; and the San Antonio Bead Society will show, teach and sell at their vendor station. Festival tickets are available online, at the institute’s museum store, or at the gate on event day. VIA will reroute Primo route 100 (Fredericksburg Road) and Viva Centro 301 to the gate at Tower of the Americas Way. Limited parking is available near the institute. Festival organizers recommend ride share, carpool or public transportation. For more information, call 210-458-2300 or visit TexanCultures.com.